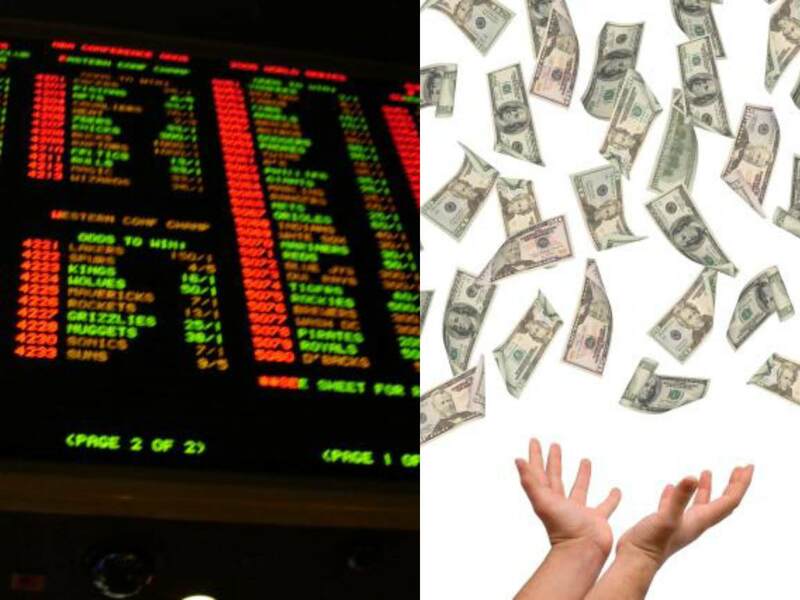 Picking stocks is a tricky game and so is sports betting. With the NFL and NCAA football seasons only a few months away, we can analyze the professional sports-betting industry to better understand the complexities behind making money in the stock market. Anybody who has traveled to Las Vegas, and bet on a sporting event, understands that simply choosing a game winner is not enough for a casino to pay you winnings. You also need to forecast how many points you think a certain team will win or lose by (i.e., the so-called “spread”) – see also What Happens in Vegas, Stays on Wall Street. In the world of stocks, winning/losing is not measured by spreads but rather equities are measured by valuation (e.g., Price/Earnings or P/E ratios). Florida Gators vs. Charleston Southern Buccaneers: Without knowing a lot about the powerhouse Southern Buccaneers squad from South Carolina, 99% of respondents polled before the game are likely to unanimously select the winner as Florida – a consistently dominant, nationally ranked powerhouse program. The tougher question becomes trickier if football observers are asked, “Will the Florida Gators win by more than 63 points?”(see picture below). Needless to say, although the Buccs kept it close in the first half, and only trailed by 42-3 at halftime, the Gators still managed to squeak by with a 62-3 victory. Importantly, if you had bet on this game and placed money on the Florida Gators, the overwhelming pre-game favorite, the 59 point margin of victory would have resulted in a losing wager. In order for Gator fans to win money, they would have needed Florida to win by 64 points. If investing and sports betting were easy, everybody would do it. The reason sports betting is so challenging is due to very intelligent statisticians and odds-makers that create very accurate point spreads. In the investing world, a broad swath of traders, market makers, speculators, investment bankers, and institutional/individual investors set equally efficient valuations over the long-term. The goal in investing is very similar to sports betting. Successful professionals in both industries are able to consistently identify inefficiencies and then exploit them. Inefficiencies occur for a bettor when point spreads are too high or low, while investors identify inefficient prices in the marketplace by shorting expensive stocks and buying cheap stocks (i.e., undervalued or overvalued). What Sidoxia’s “Magic Quadrant” demonstrates is a framework for evaluating stocks. 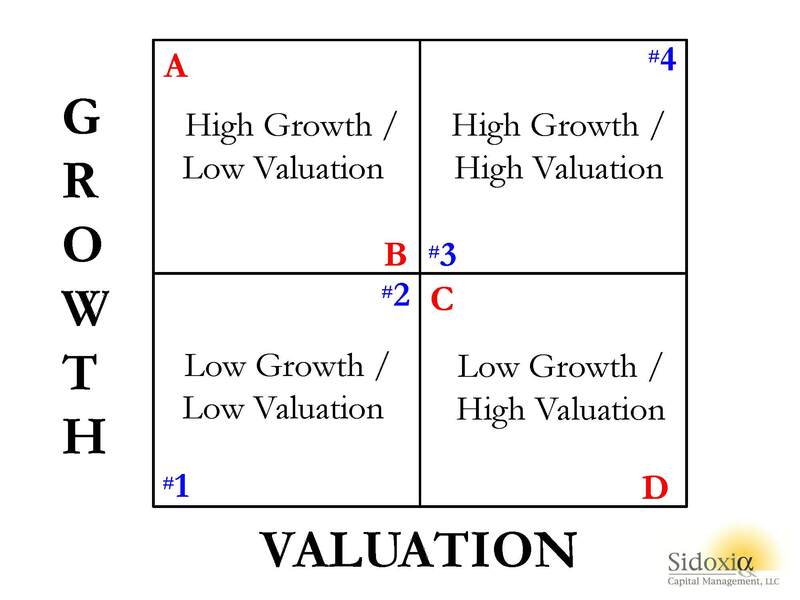 By devoting a short period of time reviewing the quadrants, it becomes apparent fairly quickly that Stock A is preferred over Stock B, which is preferred over Stock C, which is preferred over Stock D. In each comparison, the former is preferred over the latter because the earlier letters all have higher growth, and lower (cheaper) valuations. The same relative attractive relationships cannot be applied to stocks #1, #2, #3, and #4. Each successive numbered stock has higher growth, but in order to obtain that higher growth, investors must pay a higher valuation. In other words, Stock #1 has an extremely low valuation with low growth, while Stock #4 has high growth, but an investor must pay an extremely high valuation to own it. While debating the efficiency of the stock market can escalate into a religious argument, I would argue the majority of stocks fall in the camp of #1, #2, #3, or #4. Or stated differently, you get what you pay for. For example, investors are paying a much higher valuation (high P/E) for Tesla Motors, Inc (TSLA) for its rapid electric car growth vs. paying a much lower valuation (low P/E) for Pitney Bowes Inc (PBI) for its more mature mail equipment business. The real opportunities occur for those investors capable of identifying companies in the upper-left quadrant (i.e., Stock A) and lower-right quadrant (i.e., Stock D). If the analysis is done correctly, investors will load up on the undervalued Stock A and aggressively short the expensive Stock D. Sidoxia has its own proprietary valuation model (Sidoxia Holy Grail Ranking – SHGR or a.k.a. “SUGAR”) designed specifically to identify these profitable opportunities. The professions of investing and sports betting are extremely challenging, however establishing a framework like Sidoxia’s “Magic Quadrants” can help guide you to find inefficient and profitable investment opportunities. DISCLOSURE: Sidoxia Capital Management (SCM) and some of its clients hold positions in certain exchange traded funds (ETFs) and TSLA, but at the time of publishing, SCM had no direct position in PBI, or any other security referenced in this article. No information accessed through the Investing Caffeine (IC) website constitutes investment, financial, legal, tax or other advice nor is the information to be relied on in making an investment or other decision. Please read disclosure language on IC Contact page. In a world of seven billion people and over 200 countries, guess what…there are a plethora of crises, masses of bad people, and plenty of lurking issues to lose sleep over. On the contrary to excesses, corporations have been slow to hire and invest due to heightened risk aversion induced by the financial crisis. Consumers have saved more and lowered personal debt levels. The Federal Reserve took unprecedented measures to stimulate the economy, but these efforts have since been reversed. The Fed has even signaled its plan to reduce its balance sheet later this year. As the expansion has aged, corporations and consumer risk aversion has abated, but evidence of excesses remains paltry. Attempting to predict a market crash is a Fool’s Errand, but more important for investors is periodically reviewing your liquidity needs, time horizon, risk tolerance, and unique circumstances, so you can optimize your asset allocation. There will be plenty more head fake surprises, but if conditions remain the same, investors should not be surprised by new stock highs. This article is an excerpt from a previously released Sidoxia Capital Management complimentary newsletter (June 1, 2017). Subscribe on the right side of the page for the complete text. There has been a massive storm of political rain that has blanketed the media airwaves and internet last month, however, the stock market ignored the deluge of headlines and focused on more important factors, as prices once again pushed to new record highs. Over the eight-year bull market, the old adage to “sell in May, and go away,” once again was not a very successful strategy. Had investors heeded this advice, they would have missed out on a +1.2% gain in the S&P 500 index during May (up +7.7% for 2017) and a +2.5% surge in the technology-driven NASDAQ index (+15.1% in 2017). French Elections: In the wake of last year’s U.K. “Brexit”, fears of an imminent “Frexit” (French Exit) resurfaced ahead of the French presidential. Emmanuel Macron, a 39-year-old former investment banker, swept to a decisive victory over National Front candidate Marine Le Pen by a margin of 66% to 34%. Firing of FBI Director: President Trump fired FBI Director James Comey based on the recommendation of deputy attorney general Rod Rosenstein, who cited Comey’s mishandling of Hillary Clinton’s private email server investigation. The president’s critics claim Trump was frustrated with the FBI’s investigation into the administration’s potential ties with Russian officials in relation to the 2016 presidential elections. Comey is expected to testify next week to Congress, where he will likely address reports that President Trump asked him to drop the FBI’s investigation into former National Security Advisor Michael Flynn during a February meeting. Trump Classified Leak to Russians: Reports show that President Trump revealed classified information regarding the Islamic State (ISIS) to the Russian foreign minister during an Oval Office meeting. The ISIS related information emanating from Syria reportedly had been passed to the U.S. from Israel, with the provision that it not be shared. Kushner Under Back Channel Investigation: President Trump’s son-in-law and senior advisor, Jared Kushner, is under investigation over discussions to set up a back channel of communication with Russian officials. At the heart of the probe is a December meeting Kushner held with Sergey Gorkov, an associate of Russian President Vladimir Putin and the head of the state-owned Vnesheconombank, a Russian bank subject to sanctions imposed by President Obama. Back channels have been legally implemented by other administrations, but the timing and nature of the discussions could make the legal interpretation more difficult. Trump’s First Foreign Trip: A whirlwind trip by President Trump through the Middle East and Europe, resulted in commitments to Middle East peace, multi-billion contract signings with the Saudis, pledges to fight Muslims extremism, calls for NATO members to pay their “fair share,” and demands for German President Angela Merkel to address the elevated trade deficit with the U.S. Subpoenas Issued to Trump Advisors: The House Intelligence Committee issued subpoenas to ousted National Security Adviser Michael Flynn and President Trump’s personal attorney, Michael Cohen, as it relates to potential Russian interference in the presidential campaign. Flynn reportedly plans to invoke his Fifth Amendment rights in response to a separate subpoena issued by the Senate Intelligence Committee. Repeal and Replace Healthcare: The Republican-controlled House of Representatives narrowly passed a vote to repeal and replace the Affordable Care Act after prior failed attempts. The bill, which allows states to apply for a waiver on certain aspects of coverage, including pre-existing conditions, received no Democratic votes. While the House passage represents a legislative victory for President Trump, Senate Republicans must now take up the legislation that addresses conclusions by the nonpartisan Congressional Budget Office (CBO). More specifically, the CBO found the revised House health care bill could leave 23 million more Americans uninsured while reducing the federal deficit by $119 billion in the next decade. North Korea Missile Tests: If domestic political turmoil wasn’t enough, North Korea conducted an unprecedented number of medium-to-long-range missile tests in an effort to develop an intercontinental ballistic missile (ICBM) capable of hitting the mainland United States. Due to the rising tensions, the U.S. and South Korea have been planning nuclear carrier drills off the coast of the Korean peninsula. 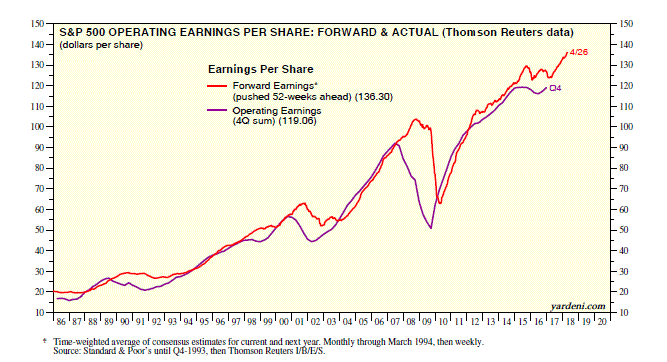 Record Profits: Stock prices follow the direction of earnings over the long-run. As you can see below, profits vacillate year-to-year. However, profits are currently surging, and therefore, so are stock prices – despite the negative political headlines. Near Generationally Low Interest Rates: Generally speaking, most asset classes, including real estate, commodities, and stock prices are worth more when interest rates are low. 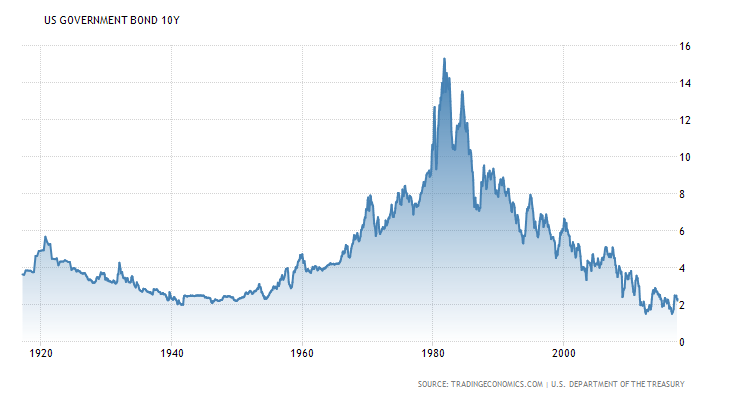 When you could earn 15% on a bank CD in the early 1980s, stocks were much less attractive. Currently, bank CDs almost pay nothing, and as you can see from the chart below, interest rates are near a generational low – this makes stock prices more attractive. Attractive Valuations: The price you pay for an asset is always an important factor, and the same principle applies to your investments. If you can buy a $1.00 for $0.90, you want to take advantage of that opportunity. Unfortunately, the value of stocks is not measured by a simple explicit price, like you see at a grocery store. Rather, stock values are measured by a ratio (comparing an investment’s price relative to profits/cash flows generated). Even though the stock market has surged this year, stock values have gotten cheaper. How is that possible? Stock prices have risen about +8% in the first quarter, while profits have jumped +15%. When profits rise faster than prices appreciate, that means stocks have gotten cheaper. From a multi-year standpoint, I agree with Warren Buffett that prices remain attractive given the current interest rate environment. 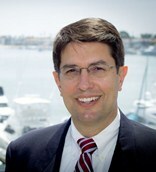 To read more about valuations, check out Ed Yardeni’s recent article on valuations. Overall, the political showers continue to come pouring down, but the economic flowers have been blooming. Politics are fun to talk about, but when it comes to your investments, do yourself a favor and pull out your umbrella, turn off the politics, and take advantage of the sweet smell of the flowers.